For Mother’s Day, I told my mom that I was going to repaint her bathroom. I then presented her with a giant pile of paint chips that I had taken the liberty to gather, and I told her to choose her colors. 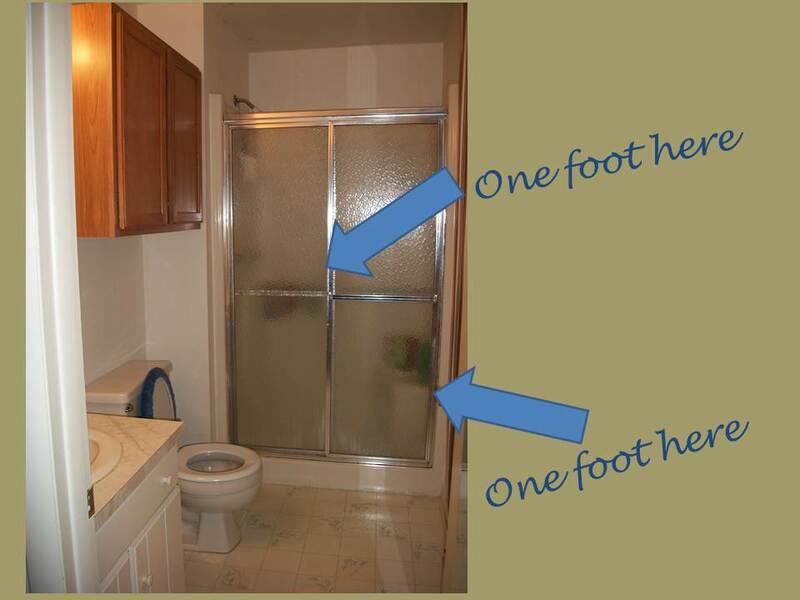 I planned a trip home when she would be working for two days, and I was determined that she would see a transformed bathroom when she returned. Yes, that’s 48 hours — including time for sleep and breaks for donuts, ice cream, and other assorted really bad for me foods. Apparently painting — or more accurately the desire to take a break from painting — makes me hungry. I knew my dad was off one of the two project days, so I also planned a few extra projects that mom didn’t know I’d be completing. Mostly, I wanted to do this to encourage my mom, but I also did it because she often comes up with terrible (or no) wish lists for Mother’s Day. Also, I noticed these weird stains on the bathroom ceiling. 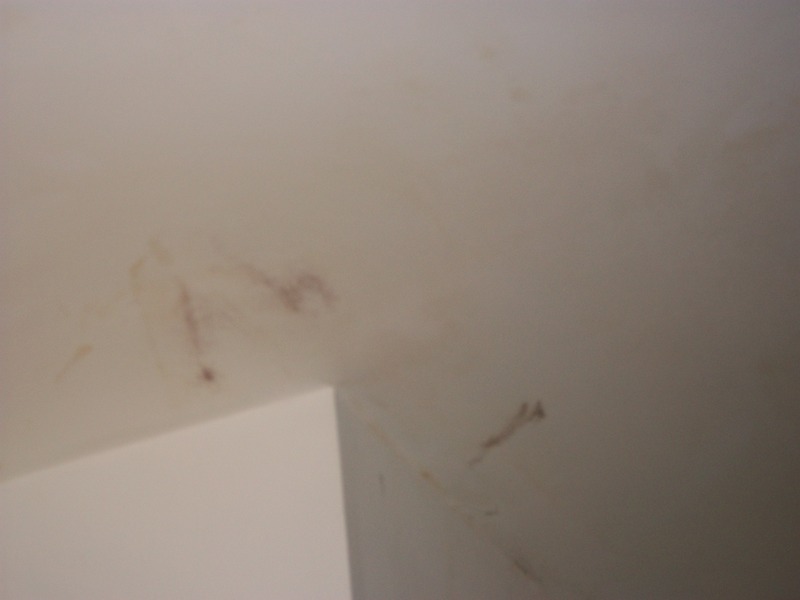 To be clear, and so nobody thinks I was raised by animals, I believe those stains were there when my parents moved in. Unfortunately, smokers lived in the house before them. You add smokers and flat white paint (which should be outlawed anyway) together, and it is not a good combo. Well, it’s not a good combo except it can be enough motivation for me to redo a whole room. So, ready for a before picture? Spoiler alert: This post won’t end with after pictures. That would be way too many pictures to show in one post, so you’ll have to stop back for part 2. Yes, here it is. The room that I made over. It seemed like so much trimming would be necessary, and I was kinda dreading the project, but to be honest, it actually wound up being kinda fun. I imagined it was my audition for an HGTV show. I totally think I should get an HGTV show with a hott (and single) carpenter. I guess I would negotiate about the carpenter, I guess, but a show could be amusing. I’m still working on what my niche could be. I do know that I was busting a move to get the room done. At times I even ran, yes, ran, through the house to gather supplies. Here’s a few more before shots. 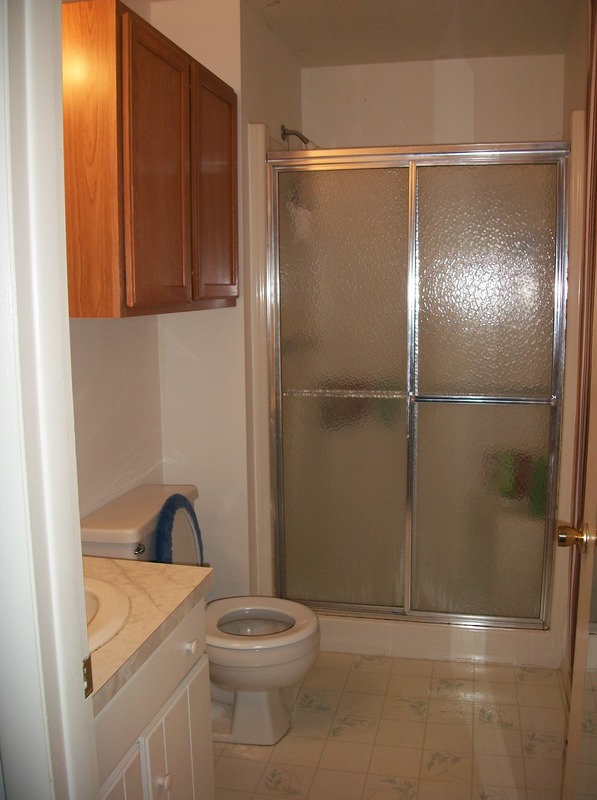 I don’t think I need to really explain what is wrong with this picture although I should mention the entire bathroom was flat-should-be-illegal white when I started. The almond paste paint you see was me getting started. Here’s the mismatched cabinets. These haven’t been this way for that long. My parents took one of the extra kitchen cabinets left over from my kitchen remodel and put it in their bathroom for extra storage — hence the mismatch. 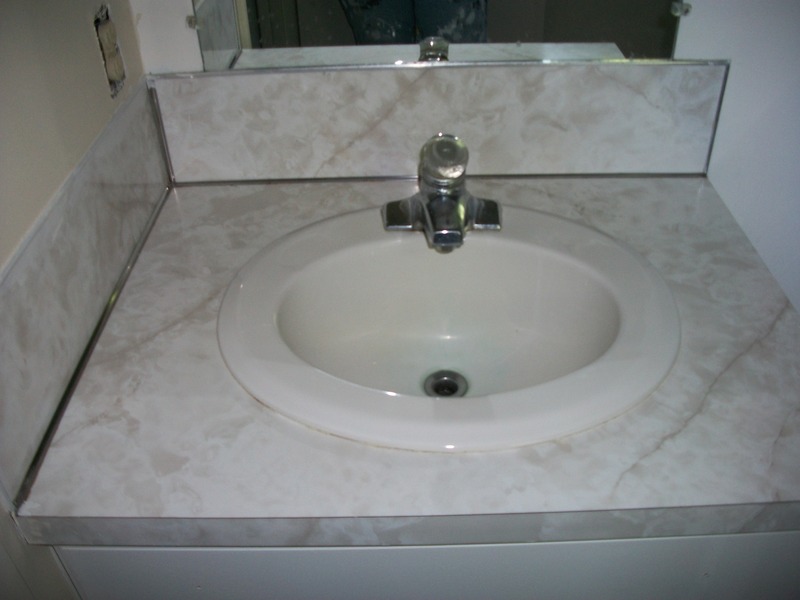 Here’s the vanity top. It wasn’t too bad since it was a rather neutral color, but it still needed an updating. I was a little scared to branch out and do that without asking for homeowner clearance, so I was pretty happy to secure my dad’s permission. 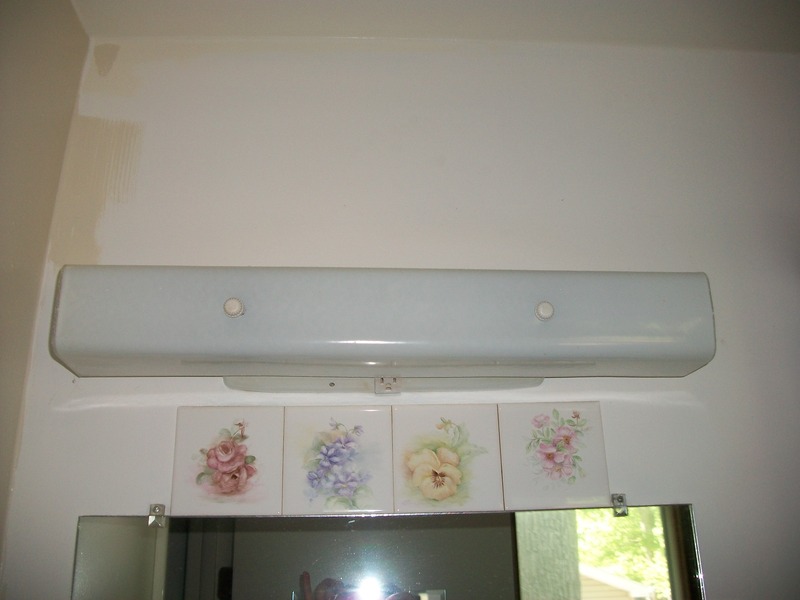 He said if I messed it up, they’d just have to pull out the vanity and put in a new one. Aw…thanks, dad. And, p.s., we don’t know how my solution is going to hold up, so keep your tools handy. Ok, so there are the before shots. The first hurdle that I had to clear was finding ladders appropriate for the job. I knew my parents didn’t have a 4 foot ladder on hand since I stole theirs. I didn’t mean to steal it, but by the time I offered to return it after having it for 5 or 6 years, my dad told me he had just gone out and bought a new 6 foot ladder. I looked around for that ladder and couldn’t find it right away. So, I wound up disentangling an 8 foot ladder out of the chaos of the garage and maneuvering it through a stairwell with an L-shaped angle to it. This is not a good idea. Seriously, don’t ever try to do something like that on your own. Imagine my disappointment to finally get it into the bathroom only to discover that this was the situation. To get it in the room and open it up, I practically had to shove it through the ceiling, which meant I couldn’t swivel it around and meant I would have had to climb the wrong side of the ladder (which I don’t think is acceptable HGTV practice). I also couldn’t find a comfortable way to paint the ceiling. It was just awkward. I was either too low and being impeded by the ladder or standing so high that my neck was crunched sideways and I was banging my head against the ceiling. Oh, and note how I either had to step over the toilet or wrangle with the door to get from one side of the room to the other. I was getting a later start than expected because it had taken me 400% longer than expected to clean up my own atrocious mess of a house before I left it, so I only spent a short amount of time trying to make do with this situation before I was about to go into nuclear meltdown. Hm…if I’m willing to look like a basketcase on TV, maybe my HGTV show could involve me getting in way over my head on projects, getting to the verge of nuclear meltdowns, and then having the hott carpenter come in to rescue me and teach me new skills so I am redeemed. Yeah, I think that is a workable plot line. Anyway, since I have no TV show and no hott carpenter, I decided to text my dad to ask where the 6 foot ladder was. 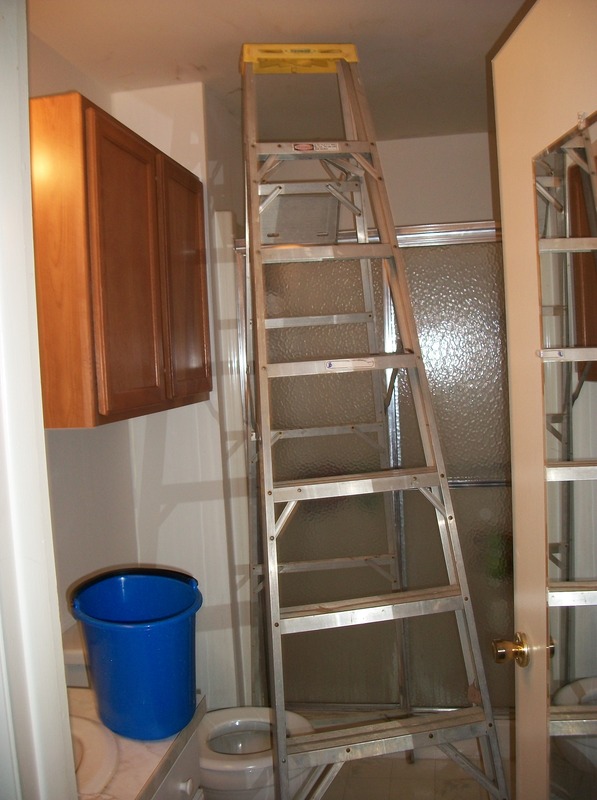 Then, there was the little problem of how to paint above the shower. 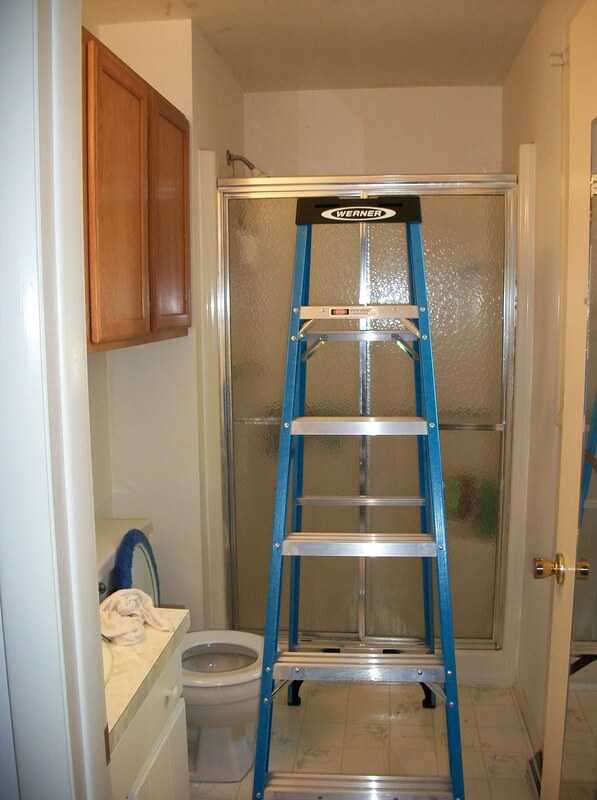 No ladder could go on the floor in there for fear of cracking the shower stall. I do want to be a little overly dramatic here and say that I could have seriously injured myself with my solution, which was to balance in a split in the shower with one foot on the shampoo shelf/built-in seat and one foot holding just a little weight as it was balanced on the short bar where washcloths hang. 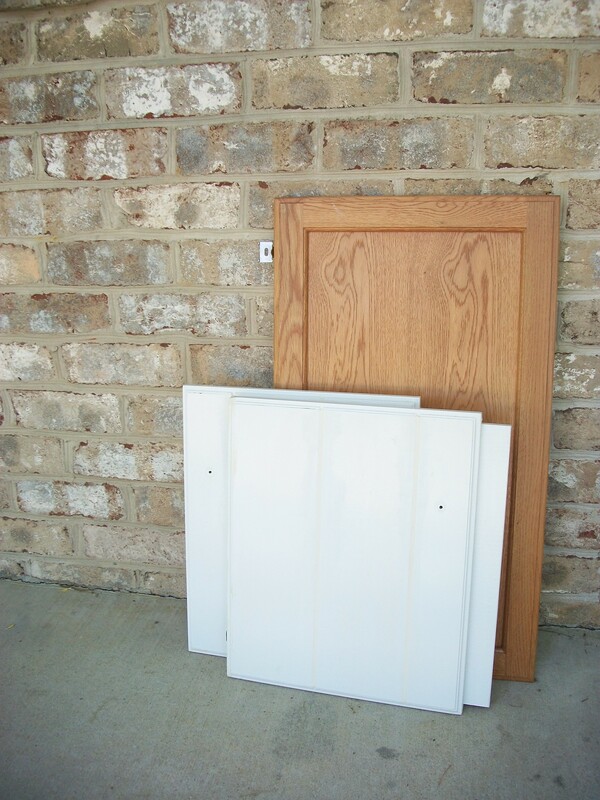 Hmm….wonder how the hott carpenter could have helped out here. I’m telling you, HGTV, this could be a real hit show. So, that’s how the whole bathroom project started. You’ll have to tune in to the next post for the after pictures.